Ideally located on 43 Enderley Avenue in the famous Surfers Paradise, Anacapri Budget Apartments Surfers Paradise provides you easy access to the Gold Coast’s most thrilling destinations. You need merely a few paces to reach the famous fine sand and temperate waters of Surfers Paradise Beach, and a 10 minute stroll to the diverse and exciting restaurants and night clubs of Cavill Avenue. Our spacious and relaxing self contained family apartments Surfers Paradise are also close to the Gold Coast Hinterland, exciting theme parks like Dreamworld and Movie World, and major shopping destinations like Pacific Fair, Robina Town Centre, Australia Fair and Harbourtown. 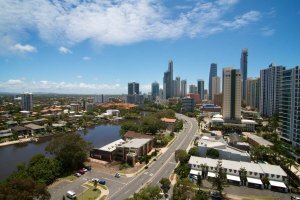 Airport - Surfers Paradise and our family apartments are about a 25 minute drive from the Gold Coast Airport and an hour from Brisbane Airport. We provide secure basement parking for your vehicle. Taxi - You can contact Gold Coast Cabs on 131 008, but there is likely to be a taxi line at the airport on your arrival. The fare to Surfers Paradise will start from around $55, depending on traffic. Bus - Ride the public transport Surfside buses from the Gold Coast Highway opposite the airport. Transfers - We encourage you to take the next flight to the Gold Coast, and claim your fantasy Gold Coast beach holiday now. 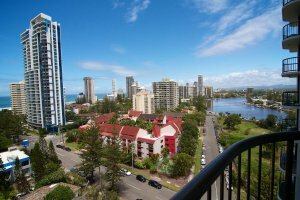 The friendly and approachable Anacapri 2 bedroom apartments Surfers Paradise tour desk staff would only be happy to book one-way or return transfers for you. Directions for arrival by car. Please note that the light rail is currently under construction between Broadbeach and Parkwood so you may need to allow extra travel time. Take the Pacific Highway and take exit 66 to the Smith Street Motorway. Continue to the end of this road and at the T intersection turn right onto the Gold Coast Highway. Stay on this road and turn left in to Surfers Paradise Blvd drive through Surfers Paradise. Go past the Q1 building (on your left) then turn right into Enderley Avenue. Anacapri Apartments is on your right. 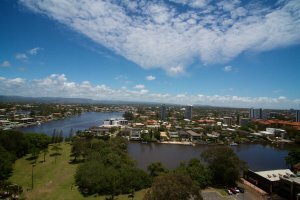 Take the Gold Coast Highway through Broadbeach. Continue on the main road, you will pass Anacapri. Turn right into Clifford St, then first right. Turn right in to Enderely Avenue (3rd on the right). Anacapri Gold Coast Family Apartments is at the end of the road on your right, at the end of the cul-de-sac.